Top Twitter officials, including its CEO Jack Dorsey, have declined to appear before a parliamentary committee that had summoned them next week over the issue of safeguarding citizens’ rights on social media platforms citing ‘short notice’ period. Sources said Twitter has written a letter conveying their inability to appear before the committee because of the short notice. 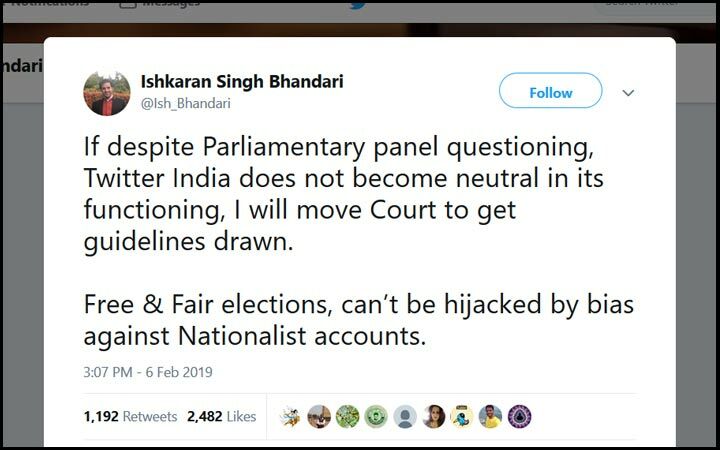 The Twitter officials have been asked to appear before the panel on February 11 for alleged bias against ‘nationalist’ accounts. Twitter’s letter has not gone down well with the panel members in what is perceived as ‘lack of seriousness’. The Parliamentary Committee on Information Technology, headed by BJP Member of Parliament Anurag Thakur, had issued summons to Twitter through a letter sent on February 1. It had said that the head of the organization has to appear before the panel and may be accompanied by another representative. The parliamentary panel, which has 31 members, had also summoned representatives from Ministry of Electronics and Information Technology and sources said its meeting will go ahead as scheduled.